Bloomberg | Golnar Motevalli: Just after dawn Fatemeh Ansari Mokhtari stood alone outside Tehran’s Shahid Baharloo supermarket, gripping the edge of her black chador. Hours later she was still there, now at the head of a long queue, as a refrigerated van pulled up and the driver unloaded Australian-reared lamb wrapped in white muslin. The 69-year-old was eligible for 3 kilograms of state-subsidized meat, her monthly allotment. The sidewalk where Mokhtari spent most of that Saturday morning is a front line in what’s increasingly resembling a war economy, with red meat rationed while profiteers and smugglers thrive. Iran isn’t facing a Venezuela-style collapse, but renewed U.S. sanctions have slashed oil revenue, battered the rial and pushed prices beyond the reach of many. 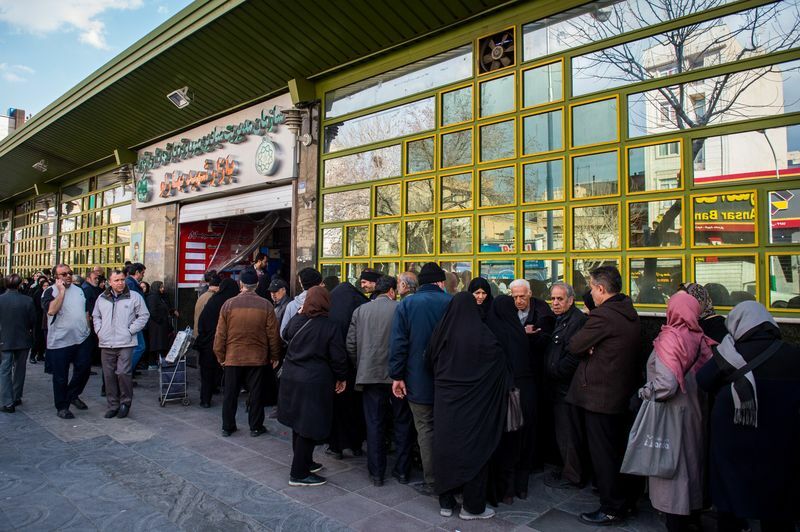 Shortages, in meat, medicine, even gasoline in some regions, are spreading; proof, say hardline conservatives, that President Hassan Rouhani’s engagement with the West has failed. The cost of red meat and poultry has surged more than 90 percent from a year ago. U.S. sanctions don’t apply to humanitarian supplies like food but their re-imposition last year froze banking channels and alarmed foreign companies doing even permitted business in Iran. The rial went into free fall and has only partially recovered. Imports, when Iran can afford them, are vastly more expensive. 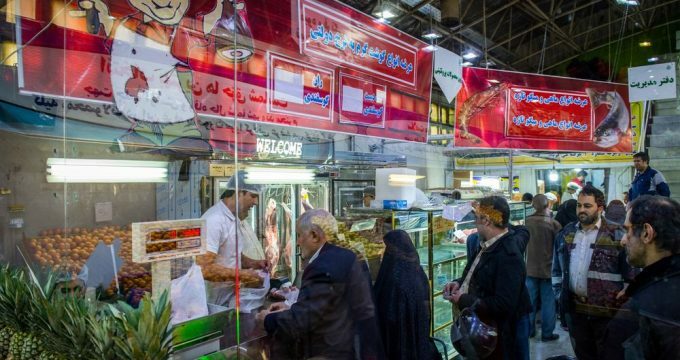 Ministers are prioritizing food and medicines, and last week parliament approved $14 billion of Iran’s dwindling resources to support domestic producers and fund “electronic coupons” for the poor that can be exchanged for essential goods. Importers already had access to cheaper foreign currency to ensure a flow of goods, but that policy is blamed for fanning price rises, with companies not passing savings onto customers despite threats of prosecution. 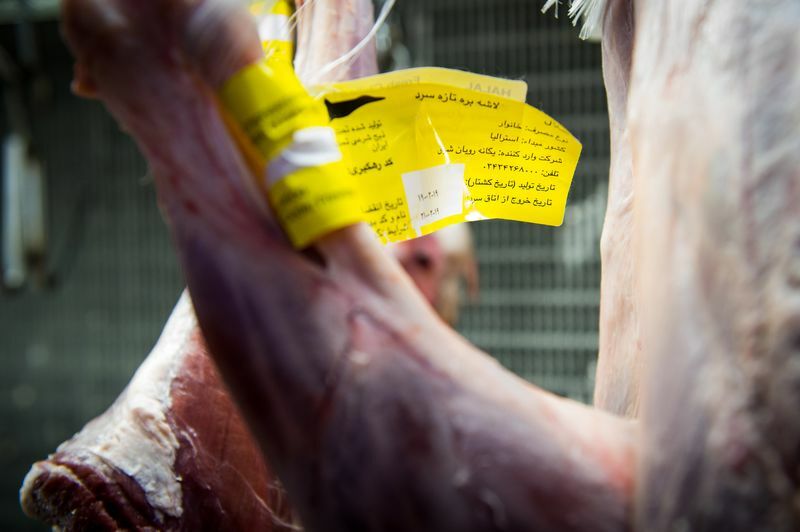 The government banned livestock exports last August to avoid shortages at home as sanctions came into force, but farmers instead smuggled animals abroad to obtain foreign currency. To stem public discontent, it has airlifted in hundreds of thousands of cows and sheep, as well as extra supplies of beef and lamb from Romania, Australia and Brazil for cut-price sale to low-income families like Mokhtari’s. Djavad Salehi-Isfahani, a non-resident senior fellow at the Brookings Institution, said the government shared some of the blame for Iran’s difficulties, describing its policy of providing subsidized dollars to importers as misguided. 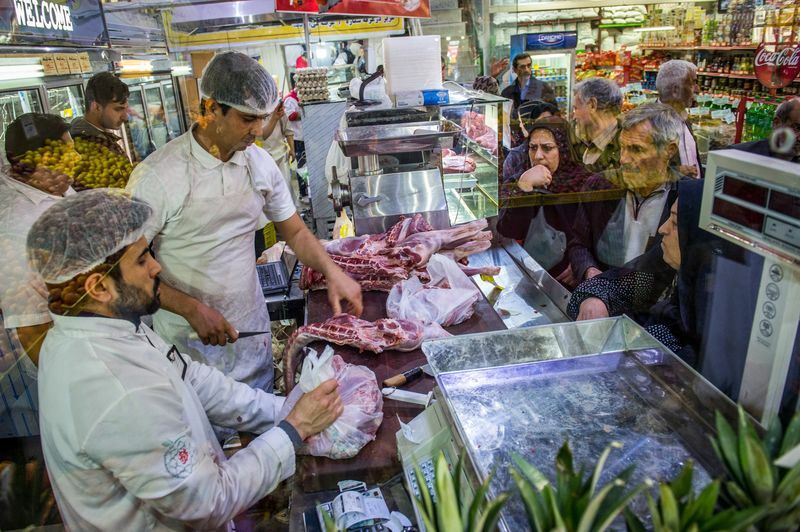 For Iranians who recall the privations of the 1980s, when their country was mired in a grinding war with Iraq, or the coordinated international sanctions that isolated their economy prior to the 2015 nuclear deal, rationing is nothing new. Things are not as bad yet as they have been in only recent memory. The Islamic Republic shows little sign of buckling, but a bout of protests that swept through provincial cities even before sanctions resumed show how quickly the tide can turn. What began then as anger over the government’s handling of the economy, quickly escalated into a display of frustration with the political establishment. Rouhani’s attempts to claw more of the economy away from the military and other state institutions have been set back by U.S. President Donald Trump’s decision last year to withdraw from the 2015 international accord that curbs Iran’s nuclear program in return for an end to some sanctions. The economic crisis means Rouhani is facing pressure from the U.S. on one side, and hardliners, who say Iran is being punished for its concessions, on the other. With U.S. officials pledging to tighten curbs on Iran’s oil sales, and import waivers for several of the nation’s oil buyers set to expire in May, life is only getting harder. It’s a grim backdrop as Iran this week celebrates Persian new year, or Nowruz, a festival normally characterized by feasts, sweets and gifts. Central bank chief Abdolnaser Hemmati said last month families should adjust spending habits and prepare to see fewer foreign brands on the shelves. In an address to supporters in the oil-exporting region of Bushehr, Rouhani promised to expand welfare programs that already target 11 million poor Iranians. “You have to persevere, I guess. Tolerate things a little,” said Ali Sabaghi, a 53-year-old worker at a state-run garment factory who was in the meat queue with his wife. Their monthly income would cover just two weeks of expenses if they hadn’t cut back. Talk of belt-tightening does little to mitigate the frustration among those who’d hoped the nuclear accord would finally ease their isolation. The arrival of the store manager didn’t improve the mood. He turned away those who’d arrived too late for a numbered ticket or hadn’t realized they needed their ID card to buy the cheaper meat. They’d have to come back another day.